A Good Year for Poppies? 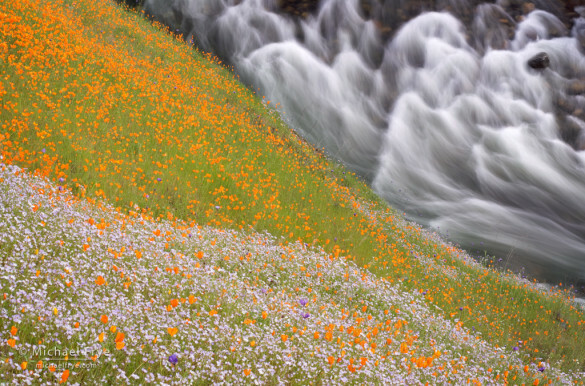 We’ve had an exceptionally dry winter, but a few well-timed storms in late February provided sufficient moisture for the poppies to start blooming in the Merced River Canyon, along Highway 140 west of Yosemite. I drove up the canyon on Wednesday and saw scattered patches of poppies. By yesterday afternoon the bloom had progressed considerably, with larger, denser swaths of orange on the hillsides. The best poppy blooms in this area often follow dry winters. Wet winters create a thick, tall carpet of foothill grasses that crowd out the poppies, while drier conditions lead to sparser grasses and more room for poppies. The two best blooms I’ve seen, in 2009 and 2012, both occurred after below-average winter precipitation. It’s too early to tell whether this year will be that good, but the rapid spread of flowers within the last four days is a good sign. If things keep progressing the bloom could be spectacular by next weekend. Or not. I’ll keep you posted! The best displays right now are in the usual early-season spots: along the north side of the canyon about two to four miles east of Briceburg (where the Telegraph Fire burned in 2008), on Grandy’s Hill (on the south side of the canyon about two miles west of the Ferguson rock slide detour), and near the beginning of the Hite’s Cove Trail (the trail starts at Savage’s Trading Post, about a mile east of the Ferguson rock slide). The poppies bloom on very steep hillsides, making them difficult to reach, so in most cases you’ll have to photograph them from a distance with telephoto lenses. But the Hite’s Cove Trail takes you right through a dense patch of flowers. Meanwhile, the redbuds are starting to bloom down along the river in this same area. A few are in full bloom, some are partially out, and others are just budding. They should be beautiful in another week or two. I give specific directions to some of the best locations for poppies and redbuds in The Photographer’s Guide to Yosemite book and iOS app. But if you just drive from Mariposa to Yosemite on Highway 140 on a sunny day you can’t miss the poppies, and the redbuds are easily visible along both sides of the river. Around the rest of California, I’ve seen reports of a nice bloom in Saddlebag Butte State Park (east of Lancaster in the Mojave Desert), but no news of any other particularly spectacular flower displays. That could change, however, so if you’re interested in photographing flowers here are some resources for current wildflower reports. One of the best is Sandy Steinman’s blog, which has a comprehensive list of links to wildflower reports. The CalPhoto group on Yahoo is a great place to get information from other photographers. DesertUSA is another valuable site, with flower reports for Arizona, Nevada, New Mexico, and Texas as well as California. Also check out the Theodore Payne Foundation’s Wildflower Hotline. Despite the dry conditions, I’m hoping that we might still see a few good wildflower displays this spring. Some colorful blooms could certainly help brighten the mood in this drought-stricken state. I enjoy that photograph from 2009. Hopefully the precipitation will pick up in your area. I’ve never had a lot of luck with wildflowers but judging from the poppies photo, it’s hard to go wrong. Thanks David. It’s easy to go wrong, or rather, to not be able to make a photograph that does the subject justice. That always takes all the skill and imagination you can muster. Good luck on your trip to the Smokies. Love that photo Michael. How late into the year do the poppies generally still have color? Thank you John! The poppy bloom doesn’t last long, typically only a couple of weeks, and that’s only because the bloom shifts – that is, early spots fade, but other places start later. There might still be some good poppy patches in early April, but that’s about as late as it’s likely to get. Thanks Michael. I guess I’ll be looking for something else the first week of June. 🙂 How are the dogwood blooms then? John, please buy The Photographer’s Guide to Yosemite book or app. It answers all these questions. Dogwoods will be long gone by June. Stunning photo from years past, Michael. My wide-open lower foothill property and beyond is normally drenched (yearly) with mixed blooms of poppies, popcorn, lupine, wild mustard, fiddlenecks, Indian paint brush, and baby blue eyes. I only have to walk out the front and back doors to snap photos. We all know this year is not normal and I have just a smattering a few wild ones–nothing worthwhile to photograph. Hope some heavy rains return next season to bring back my gorgeous outdoor carpet. Thank you Ann! Where do you live with all those flowers? Thanks for the mention. I posted about your wanderings as well. My pleasure Sandy, and thank you !